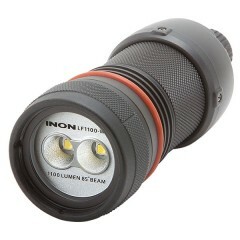 Maximum 1100 lumen and 85 degree coverage. 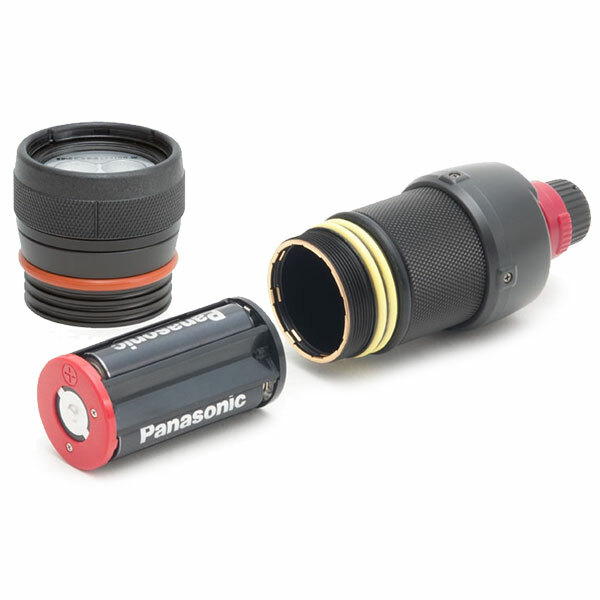 3 x AA operated compact and handy flashlight thanks to its parallel loading battery pack. 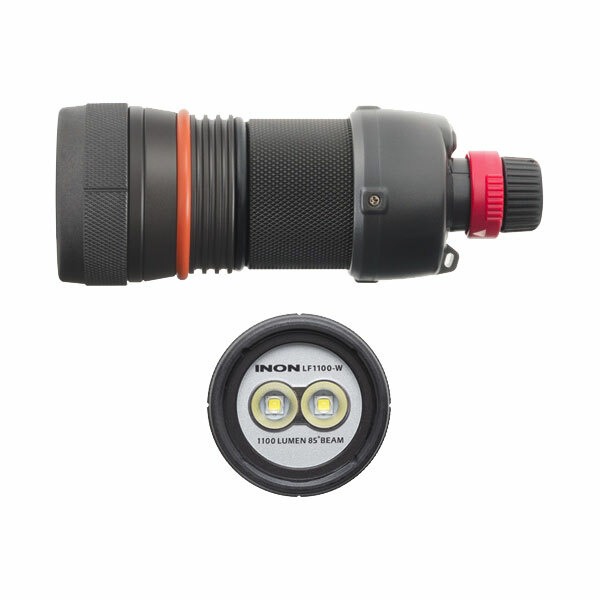 Waterproof LED flashlight for wide imaging. 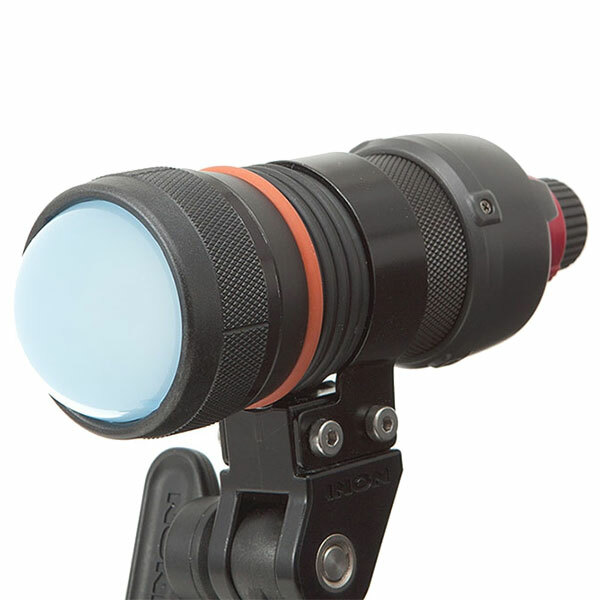 Ideal lighting device for aiming or underwater imaging thanks to carefully selected white LED chip producing quality light with enhanced color reproducibility and color temperature 5000K. 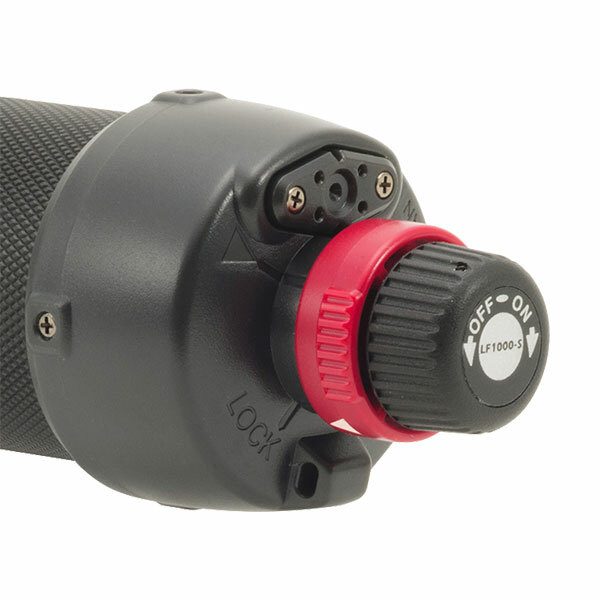 Simple yet durable rotary switch provides two power settings for various scenes; FULL with maximum intensity 1100 lumen or LOW with 300 lumen for longer burn time and usable on land as well (*). The rotary switch is equipped with Lock Ring to prevent accidental operation when the product is not in use. Operated by easily obtainable 3 x AA batteries. Using compatible rechargeable batteries like eneloop or eneloop pro enables you to share same battery charger with an INON strobe to enhance mobility and minimize your luggage space. The rated practical burn time (*) with "eneloop pro" (BK-3HCC) rechargeable batteries, is approx. 50 minutes at FULL mode or approx. 235minutes (3hrs 55 min) at LOW mode. (*) Average time to get half brightness comparing to initial performance when using eneloop pro batteries (Model code: BK-3HCC). Packaged Wide Filter LF-W increases native approx. 85 degree coverage to seamless approx. 95 degree coverage and also soften the light quality. 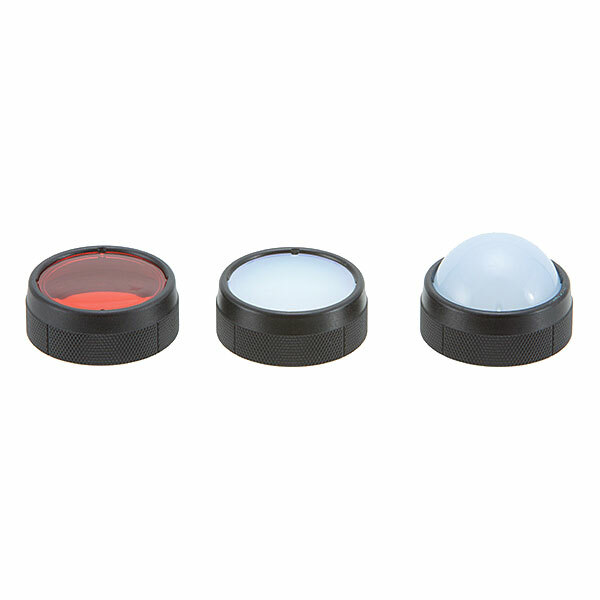 Other Red Filter LF-W is also packaged to change color tone not to stimulate shy marine lives. Optional Dome Wide Filter LF-W widens the coverage further to approx. 100 degree and spreads the beam up to approx. 180 degree direction benefitting to use the LF1100-W as a locator for other diver in poor visibility or during night dive. The light head and battery box is made from seawater-resistant aluminum alloy. Simple yet durable construction with double O-ring for moving parts supports depth rating 120m. The independent rotary switch part is equipped with a stopper to prevent accidental flooding due to over loosening. Interchangeable Light Head design enables you to use LF800-N, LF1000-S Light Head benefitting for various applications and supports possible upgrade to future model as well. Materials Corrosion resistant aluminum alloy / rigid almite, PBT, PC, Optical grass etc.